If you’ve spent enough time with an electric guitar, it’s likely you understand the relationship between the guitar and amp. You’ve likely experienced the incredible subtly volume plays in the tone of the electric guitar. Gain staging is such a huge part of electric guitar tone. There are hundreds of pedals that try to emulate the tone of a tube amp with the volume up. The most obvious sound associated with a cranked amp is overdrive. Turn a tube amp all the way up and you’re likely to hear a glorious sound. However, there are a lot of shades of color in between 1 and 10. Each of these stages add a dimension to your tone that’s hard to acquire any other way. As mentioned earlier, there are many pedals that attempt to mimic the natural compression, saturation, tone and feel of a hot amp. It’s such a complex recipe to emulate. Some have come close, but none have actually nailed perfectly. There are three places where you can get grit from an amp. The preamp tubes, the power tubes and the speaker. Simply making the preamp tubes overdrive isn’t going to sound the same as pushing the power tubes to saturate. Preamp tube overdrive tends to be more compressed and fizzy. Not bad per se, just different. This is why a lot of vintage tone enthusiasts love non master volume amps. They sound bigger and warmer. 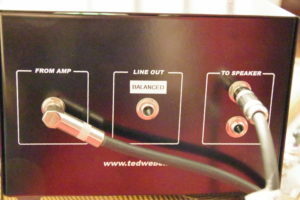 But, controlling the volume on a non master volume amp can be a real challenge if you perform in varying environments. Speakers tend to sound different as you adjust volume. The speaker does play a role in the tone. But it’s the easiest to substitute. There is a method to get the power tubes to overdrive and not blow a hole in your walls. Amp Attenuators can take the brunt of volume before it reaches your speakers. Sure, you might miss a little bit of that speaker push that adds to the tone. But, you’re not really going to miss it when it’s impossible to play that loud. An amp attenuater can allow you to get that cranked non master amp tone and feel. Yes, I did say feel. There is a magic thing that happens when you open an amp up. I’m happy as can be when I play my Victoria 35115 or Headstrong Lil King between 5-7. It works best for the music I play. There is a very particular feel to an amp at that volume. When playing off that feel is part of your performance, it can be really frustrating to have to play quieter. Using pedals to achieve that tone also doesn’t fix the issue. The pedals don’t feel the same. I’ve been using the Mass 200 Attenuator from Weber. It’s been an enlightening experience. I’ve been able to set my amp at the magical volume and adjust the loudness going to the speaker. I’ve played a few attenuators in the past and not been satisfied. Weber really did something special though. They got the recipe right. The amp doesn’t sound choked. It doesn’t sound dull. It sounds like my amp loud. You still need to push some air with an attenuator though. Diming a 100watt amp and setting the attenuator to play at whisper volume isn’t going to sound great. You have to make the speakers work a little. I set it as follows: I find the loudest volume I can get away with while the attenuator is in bypass. From here I turn the attenuator on, get the tube saturation I want and match the clean volume I had. There have been some discussion on whether amp attenuators are destructive to your amp. Reactive attenuators are perfectly safe. I’ve spoken to Mark at Victoria Amps and Wayne at Headstrong Amps. According to both of them, a well designed reactive attenuator is perfectly safe. 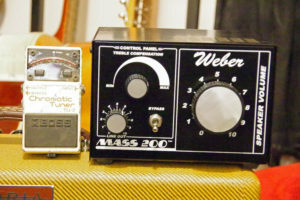 The Weber Mass 200 is a reactive attenuator. There are attenuators that are resistive NOT reactive. When searching, make sure you take note. Or just buy the Mass 200 and be happy. The only thing a reactive attenuator may do is wear your power tubes faster depending on how hard you push them. If you’re used to pushing your amp, this is no big surprise. The Weber Mass 200 is a top off the line product. I get no sense that they cut any corners. Not surprising as they’ve built quite a reputation over the years. It sells for $236 on the Weber website. It’s larger then you might expect. It sits on top of my amp. When you think about it, it takes a rather large transformer to take the brunt of a 100watt amp. The size doesn’t bother me because getting that tone is important. It’s not really going to fit in the back of your gig bag though. I bring far less pedals when I use the Weber Mass 200. The pedals aren’t my base tone anymore. They are compliments to the amp. I find it so much easier to get a great tone. I really only keep two gain devices on my board for a lot of gigs. An overdrive and an Analog Man Sun Face 2N. Often when I use backline amps without an attenuator, I have about 4 stages of gain. In a lot of ways, the Weber Mass 200 simplifies things.